What is a tessellation? It is simply a series of polygons that go on forever without overlaping and gaps. Still confused? Just put together a jigsaw puzzle, or take a good look at a brick building; imagine their extending forever, and its a tessellation! Some polygons tessellate, for example these hexagons form together perfectly to make a regular tessellation. But some polygons don't tessellate, for example the pentagon below has gaps in it. If it overlaps or has gaps in it, it doesn't tessellate. Some tessellations don't have to be made up of just regular polygons. As you can see, the tessellation to the right has stars and dimonds (or octagons and dimonds depending how you look at it). As long as the polygons don't have gaps or spaces its a tessellation. Tessellations don't have to be confined to 2D (surface). The concept can be extended to a 3D space. One of the best examples of a 3D tessellation is a cube that can be stacked up or sideways. 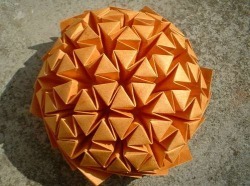 Above is an example of a 3-D Tessellation.